By the time you finish designing your garden beds and selecting plants, you may be eager to finally plant them and see the results. However, the process of planting requires a fair amount of attention and following steps so you can give your plants the best chance to survive and flourish, as well as create a pleasing arrangement. Follow these tips and steps to plant your next garden bed. Start by preparing the soil. If you are working in an existing flower bed, you will need to break up the soil, which can become compacted over time. A front-tine tiller is ideal for this. If you're starting a new garden, you will need to break up the hard-packed dirt with a rear-tine tiller. Once your soil is loosened, add compost and other soil additives and till them into the soil. There are a couple ways to determine what additives your soil needs, if any. One way is to pick up a soil test kit from a local hardware store. For a more accurate read on your soil makeup and acidity, contact your local agriculture extension for a soil test. They typically cost $20-$40 and will give you a more detailed breakdown of what nutrients your soil needs. Now that your soil is ready, set your plants on top of the soil and start arranging them. Try planting them in similar groups based on color, style and height. When grouping by height, place shorter plants toward the front edge of your flower beds and plant taller ones toward the back of the beds. By staggering the height like this, you create visual depth in your garden. To achieve a more natural look in your beds, avoid planting in straight lines and try a zigzag pattern. Now you're ready to put plants into the soil. Start by digging a hole for the plant. The hole should be just deep enough that the top of the root ball is flush or slightly below the soil line, and the hole should be wide enough to fit the root ball with a little room to spare. 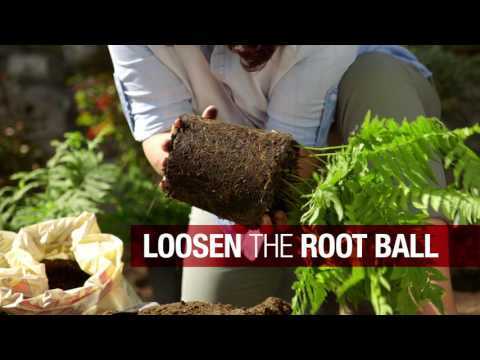 Loosen the root ball of the plant by gently pulling on outer sections of the root ball. The center of the root ball can remain packed, as the goal is to just get the outer roots loosened so they can continue to branch out from the base of the plant. Place the plant in the hole. If the top of the root ball sits more than an inch below the soil line, pull the plant out and add more soil to the hole, making the plant level with the soil. When placing the plants along the front or outward-facing edge of your beds, try planting them on a tilt. You can do this by planting them at a 30- to 40-degree angle, tilting outward. By doing this, you create a more lush look. Fill in the hole around the plant with a soil and compost mix. You can lightly pack in soil around the roots, being careful not to compact too much, which prevents root growth. Finally, spray each plant with enough water to thoroughly wet the roots. When watering, try to wet the plants with a gentle stream of water so that you don't damage the plant or spray out soil and expose any roots. You can use a watering can or hose with the nozzle on a low-pressure setting.